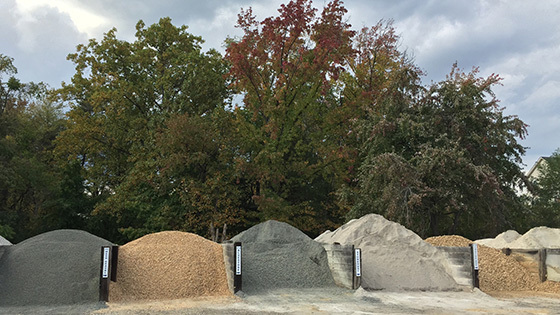 Rock Stone and Sand Yard Northern Virginia | Call (703) 339-8096 for building materials, landscape materials, and hardscape materials | Rock, Stone, Gravel, Sand, Mortar Sand, Concrete Sand, Pavers, Top Soil, Mulch, Shredded Mulch, Blend Compost, Flagstone. Accent lights, deck lights, path lights, well lights, hardscape lights, photo cells, timers, transformers, bulbs, wiring and accessories. From our two convenient Lorton, VA locations we offer an extensive variety of mulch, natural stone, patio pavers, compost and topsoil - everything you need to create and maintain a well-engineered landscape for any property. Call us today with your creations or plans. RSSY has a large inventory of natural stone in a variety of shape, size, weight, color and price level. With the high number of available options, natural stone is an ideal material for your next project. From stones for use in landscaping, to exterior stone projects, to remodeling/additions of landscapes, natural stone is a tried and true method to achieve that look you crave. At RSSY, our inventory of natural stone has been selected with more years of experience than anyone in the stone industry. With our previous stone installation experience, spanning decades, we not only understand which stone you need but also the different restraints of selected stone material. Our experience can save you time and money, thus furthering the reach and capability of your project. At RSSY, we provide aggregates for residential and commercial building contractors, concrete, landscaping, masonry, roofing, paving, excavation and government contractors. We have supplied materials and services to numerous construction projects including: highways, airports, residential housing, high rises, stadiums, bridges, landfills, shopping centers, BRAC projects and business & industrial parks. RSSY provides good clean healthy top soil for all your landscape projects. Typically, topsoil is created by sifting and screening soil to remove sticks, rocks, or other contaminants. Our top soil is not usually infused with fertilizer, but is a good rich soil. Call us for details. Renovate your backyard for maximum year-round enjoyment with a patio and firepit combination. Walls and walkways provide landscape definition, structural support, and safe pedestrian pathways. Proper driveway siting, design, and materials add so much more than vehicle access to your home. A pool with a well-designed and properly installed adjoining pool deck can increase your home value.